This tutorial provides an overview of the resources available to plant breeders through the Germplasm Resources Information Network (GRIN). GRIN is a program within the United States Department of Agriculture's Agricultural Research Service. 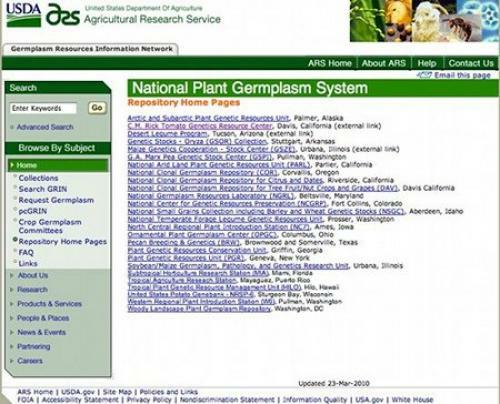 Germplasm Resources Information Network (GRIN) catalogs information on the plant germplasm, as well as other food and agricultural germplasms, held by curators at various locations in the U.S. under the U.S. Department of Agriculture's Agricultural Research Service. GRIN is managed by the National Genetic Resources Program (NGRP) staff to acquire, characterize, preserve, document, and distribute food and agricultural production germplasm to scientists. This lesson is written to address the continuing education needs of practicing plant breeders, advanced undergraduate students, and graduate students. Note: Screen-captured images of GRIN web pages are used throughout this lesson. You can access the web page shown by clicking either on the image itself or on the link in its caption. In either case, the web page will open in a new browser window. Plant breeders require genetic diversity in their trait of interest to be able to select superior lines and create new varieties. In the absence of diversity in their own holdings, breeders often look to a germplasm collection to find lines that could add this diversity. One example would be resistance to the disease late blight, which affects many crops. Several sources of resistance are known, but recently two USDA–ARS (United States Department of Agriculture–Agricultural Research Service) plant geneticists in Wisconsin found several accessions of Solanum verrucosum, a potato species, exhibiting a high degree of resistance to late blight (Yao, 2010). Research has been done on this species for more than a century, and these researchers were able to obtain accessions of this species to study the late blight gene and determine that it differed from other late blight-resistant alleles (Liu and Halterman, 2006). So where did they obtain these accessions for their research? The answer is simple; they did a search of the germplasm database maintained by the USDA for this species and other potatoes that had late blight resistance and submitted a request for the germplasm. 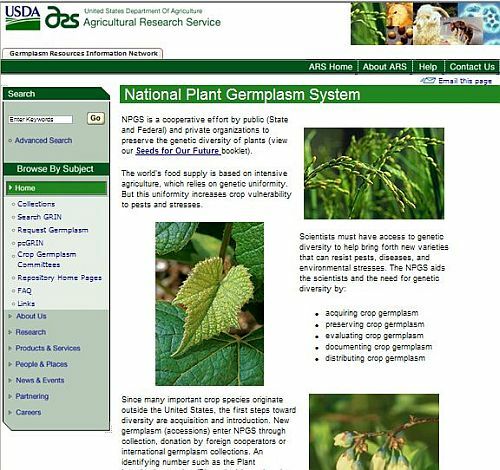 The USDA houses the Germplasm Resources Information Network (GRIN), which has the mission to support four projects: the National Plant Germplasm System (NPGS), the National Animal Germplasm System (NAGP), the National Microbial Germplasm Program (NMGP), the National Invertebrate Germplasm Program (NIGRP). GRIN allows germplasm users to access the collection's databases to identify accessions needed for research and breeding programs. Searches can be made based on a variety of criteria—including passport information, characterization data, and availability—to allow for effective management and utilization of the national germplasm collections. Passport information includes information such as where and under what environmental conditions the original germplasm was collected. Characterization data includes any traits known about the germplasm, such as disease or insect resistance. Finally, each germplasm accession provides information to let a user know where s/he can obtain samples of a certain accession. Under the GRIN umbrella is the National Plant Germplasm System (NPGS), a network of people and organizations preserving the genetic diversity of the major and some minor crop plants (USDA-ARS, 1996) (Fig. 1). Plant germplasm from all over the world, including the United States, can be found in the NPGS. Following acquisition, curators and other scientists preserve, evaluate, and catalog the germplasm so it can be preserved and distributed for others to use. The Agricultural Research Service (ARS) coordinates the federal, state, and private organizations and research units that are members of the NPGS. Every week, the statistics on the holdings of the NPGS are recalculated, as more accessions are added and updated information about current accessions becomes available through research and evaluation. As of November 7, 2010 there were 536,129 crop plant accessions representing 223 families; 2,209 genera; and 13,458 species. Figure 1. 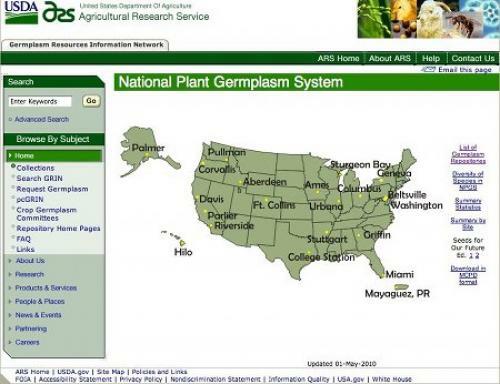 Home page of the National Plant Germplasm System. Screenshot credit: Heather Merk, The Ohio State University. The entire NPGS collection is dispersed geographically because of environmental variations that affect where a plant grows. However, it also avoids the danger of losing an entire collection held in only one place. A total of twenty-six germplasm repositories are located from Puerto Rico to Alaska. Figure 2. Locations of the U.S. plant germplasm repositories. Screenshot credit: Heather Merk, The Ohio State University. Figure 3. List of the U.S. plant germplasm repositories. Screenshot credit: Heather Merk, The Ohio State University. Additional information can be found about each of the germplasm repositories by clicking on any of the links as seen in Fig. 3. If you are interested in potatoes, click on the Potato Germplasm Introduction Station, which is located in Sturgeon Bay, WI. The current curator is John Bamberg and he works only on one crop: potato (Figs. 4, 5). Figure 4. Homepage for the Potato Germplasm Introduction Station. Screenshot credit: Heather Merk, The Ohio State University. Figure 5. Crops evaluated by the Potato Germplasm Introduction Station in Wisconsin. Screenshot credit: Barbara Liedl, West Virginia State University. The potato accessions in Sturgeon Bay have been evaluated for a variety of traits. After clicking on the crop name ("potato", in this case), you can see what has been evaluated by following the link "List of Descriptors" (Fig. 6). Figure 6. Potato crop web page in GRIN, which includes a link to the list of descriptors (circled in red), a list of species in the crop, and a list of citations. Screenshot credit: Barbara Liedl, West Virginia State University. If you don't know anything about a crop, a good place to start is the descriptors list to find information on important traits and other characteristics that have been reported on its various germplasm resources. The potato descriptor list is long and has a large amount of information (Fig. 7). Figure 7. List of potato descriptors. Screenshot credit: Barbara Liedl, West Virginia State University. More information on a specific descriptor can be obtained by clicking on it. Here we use early blight resistance as an example by scrolling down to the list of characterized disease traits and clicking on #11, Early Blight (EBLIGHT) (Fig. 8). At the time of writing this lesson, eighteen accessions were noted in the database to be very resistant to early blight. Figure 8. Potato descriptor for early blight. Screenshot credit: Barbara Liedl, West Virginia State University. Clicking on "18" (Fig. 8, red arrow), will produce a list of the eighteen accessions that have been classified as very resistant to the early blight pathogen (Fig. 9). Figure 9. List of very resistant early blight potato accessions. Screenshot credit: Barbara Liedl, West Virginia State University. Further information on a specific accession can be obtained by clicking on its PI number; alternatively, all of the listed accessions can be requested by clicking on the link "Request" (Fig. 9). For this example, we have chosen to look at information about PI 243340 (circled in red in Fig. 9). The passport information on this accession will include the name of the species, family, where it was collected, where the accession is stored, who donated the accession, and its availability (Fig. 10). The germplasm can be requested directly from the passport information page by clicking on the "Request this germplasm" link. Figure 10. Descriptor for the PI 243340 very resistant early blight potato accession. Screenshot credit: Barbara Liedl, West Virginia State University. Clicking on the "observation" link in Fig. 10 will bring up a list of all the descriptors that have been used to evaluate this accession. For our example, PI 243340 has been evaluated twice for early blight ("EBLIGHT" circled in red in Fig. 11). In one case the descriptor listed it as medial and the second as "very resistant", which is how we found this accession in our search. Additional information on any of these observations can be obtained by clicking on the associated "study/environment" link. In our example, the study environment is listed as "ERBL MANZE 85" which is a live link to the information (see red arrow in Fig.11). Figure 11. Potato early blight descriptor. Screenshot credit: Barbara Liedl, West Virginia State University. Clicking on the study/environment link "ERBL MANZE 85" in Fig. 11 brings up the information on all of the accessions evaluated for early blight in this field study done in 1985 (Fig. 12). General information is available about the study, such as where it was done and how it was set up and evaluated. In addition, a link is available to either view or download the study information for all the traits evaluated. In this case, only one trait (early blight) was evaluated , but 247 accessions were included in the evaluation. Figure 12. Study/evaluation information assessing early blight in a 1985 field study with 247 accessions. Screenshot credit: Barbara Liedl, West Virginia State University. Finding accessions for potato is relatively easy, as all of the accessions are found in one location in the USDA system. But how do you find information on accessions that might be saved in several locations? That will require using one of the search options that are discussed below. Searching for accessions in the GRIN database will require setting up a "query". The information on all of the GRIN accessions are stored in a database, and to find accessions you need to define what you want by using word(s) or character(s) to compare against the information found in the database. Searching this way lets you not only search all of the locations that have germplasm stored, but it also allows you to combine terms or descriptors together. The first type of query is the standard "text search query". In this query, all the fields of information for each accession are searched. This means that not only the accession number and species are searched, but also the descriptor list and any additional text that is found in the accession passport. One caveat is that wild cards can not be used in the search. A wild card is a character—in our case an asterisk, "*"—that is used in a word to represent any other character or characters past the given text. For example, a wild card search of the text "plant*" would bring back not only those accessions containing the word "plant", but also those containing "plants", "planter", and so forth. So, having the ability to use a wild card could be helpful, but we can't use one for the text search query. However, we will be able to use it for other query types. To use this form, enter your text into the field. Then press the "Submit Text Query" button beneath your text to obtain the results of your query. In this example we entered the text "tomato" (Fig. 13). Figure 13. Text search query on "tomato". Screenshot credit: Barbara Liedl, West Virginia State University. A simple text search with "tomato" retrieves 3,834 active accessions; if you include the inactive accessions it would be 4,230 as of January 10, 2011 (Fig. 14). Figure 14. Results of a text search query on "tomato". Screenshot credit: Heather Merk, The Ohio State University. A large number of accessions result from a search on as general a term as "tomato", leaving many to sort through to find something that specifically meets your needs. You can narrow your search by using more specific keyword criteria. For example if you were only interested in the tomato cultivars in the NPGS, you could type "tomato cultivar", which takes the list of results down to 139 active accessions (Fig. 15). Figure 15. Results of a text search query on "tomato cultivar". Screenshot credit: Heather Merk, The Ohio State University. To be even more specific, you could type in the exact tomato cultivar for which you would like to obtain seed—WV63, for instance. One result for this query is the accession "tomato WV63" (Fig. 16). Figure 16. Results of a text query search on "tomato WV63". Screenshot credit: Heather Merk, The Ohio State University. Click on the title to get more information on the particular accession. Examples of information included in the GRIN database are a description (narrative) of the accession, including any known trait information; who donated the seed; and any literature associated with this accession. In addition, you can request the germplasm directly from this page as well as through the "Request Germplasm" link on the main GRIN page (Fig. 17). Figure 17. "West Virginia 63" accession. Screenshot credit: Heather Merk, The Ohio State University. If you know the PI #, such as PI 128216, to retrieve that accession record, you can type that number into the text query box from the main portal page for searching accessions. Be sure to include a space between the "PI" and the accession number when typing it into the search box (Fig. 18). Figure 18. Results of a text search query on "PI 128216". Screenshot credit: Heather Merk, The Ohio State University. You can also search for all tomatoes with late blight resistance by typing "tomato late blight" into the query box. Four accessions are found, including the variety "WV 63". Note that the word "late" is also highlighted but is not always part of "late blight", but is also associated with "late-maturing" (circled in red). To eliminate this problem, you could type combine late blight as a single term by using quotes before and after (i.e., "late blight"). Therefore, be careful in constructing searches and analyzing the results (Fig. 19). Figure 19. Results of a text search query on "tomato late blight". Screenshot credit: Heather Merk, The Ohio State University. The text search query allows you to do a generalized search based upon some key terms you type in, but what if you know exactly what germplasm you want to research or request? A second type of query is the simple query, which can be used to quickly look up a cultivar name, PI number, collector number, or other identifier. After typing in one of those items, just press the "Submit Simply Query" button to find those specific accessions. A simple query also allows you to use the "*" as a wild card character if you are unsure of the spelling or are searching for all cultivars starting with a specific letter or word. For instance, you can type in "yellow*", and that will bring up all plants in the database with "yellow" at the start of the cultivar name (Fig. 20). Figure 20. Results of a simple query on "yellow*". Screenshot credit: Heather Merk, The Ohio State University. To find just tomatoes with yellow at the start of the name, you can add the genus name "Solanum" to a wild card search to further refine the results (e.g., Yellow*::Solanum) (Fig. 21). Figure 21. Results of a simple query on "Yellow*::Solanum". Screenshot credit: Heather Merk, The Ohio State University. The final query type is an advanced query, which allows you to more narrowly define a search by inputting more specific information. Options in this query include Accession Identifier, Taxonomy, Location, and Additional Criterion. These can be combined to restrict the query. For this example, we are going to find out how many Solanaceae accessions have been added to the Northeast Regional PI Center in the last five years. First, we will enter Solanaceae in the Family box under the Taxonomy heading. Next, under Additional Criteria, we will choose the Northeast Regional PI Center from the list of repositories. Finally, we will choose to limit the query to the previous five years by selecting "5" in the "Check one to limit your selection(s)" drop-down menu. Be sure to also check the circle next to this category and then press the "Submit request" button (Fig. 22). Figure 22. An advanced search query. Screenshot credit: Heather Merk, The Ohio State University. Results from this advanced search show that 80 active and available Solanaceae accessions have been received in the last five years at the Northeast Regional PI Station. Not only are publicly bred cultivars (i.e., G 32790) available, but in some cases varieties from companies such as Heinz can also be found in the NPGS (i.e., PI 652934) (Fig. 23). Clicking on an individual accession's title brings up this more detailed information. Figure 23. Advanced search results for Solanaceae accessions acquired by the Northeast Regional Introduction Station in the last five years (denoted with a red circle). Screenshot credit: Heather Merk, The Ohio State University. Up to this point in the lesson, we have discussed the various paths for searching the germplasms accessions catalogued and maintained by GRIN. After finding the accession(s) you wish to use in your own plant breeding program, the obvious next step we need to describe for you is how to gain access to a sample of it. Germplasm can be requested in several ways from GRIN. 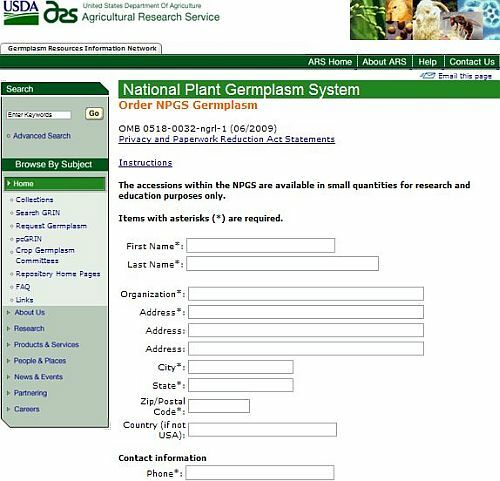 The first way is to click on the "Request Germplasm" link on the left side column of the home page for GRIN (Fig 20) and choosing one of three options: 1) request via the accession page; 2) fill out a request form; or 3) send an email to the maintenance site (found on the accession page) or the National Plant Germplasm Laboratory. Following our example for PI 128216, we will next describe how to request the germplasm via the accession page. Figure 24. GRIN Request Germplasm page. Screenshot credit: Heather Merk, The Ohio State University. If you want to request via a link on an accession page, all you need to do is click on the "Request this germplasm" link. In our case we used a simple query for "PI 128216" and then opened its individual accession page. If you scroll part way down that page, you'll find the "Request this germplasm" link. Go ahead and click on it, even if you want to search for additional germplasms (Fig. 25). Figure 25. An accession entry with the link to request germplasm circled in red. Screenshot credit: Heather Merk, The Ohio State University. A screen indicating your accession(s) and some descriptive information will appear in a table. At this point you can search for more accessions, remove this or other accessions or complete the germplasm request by clicking on the appropriate links (Fig. 26). Figure 26. A germplasm request for an accession. Screenshot credit: Heather Merk, The Ohio State University. If you choose to complete the germplasm request with this one PI, then the following screen will appear asking for information about your request. Use your mouse to click inside each data entry box or use the tab key to jump to the next data entry box on the form. Be sure to complete all the requested information prior to clicking the "Submit Request" button (Fig. 27). Figure 27. The germplasm request order form. Screenshot credit: Heather Merk, The Ohio State University. 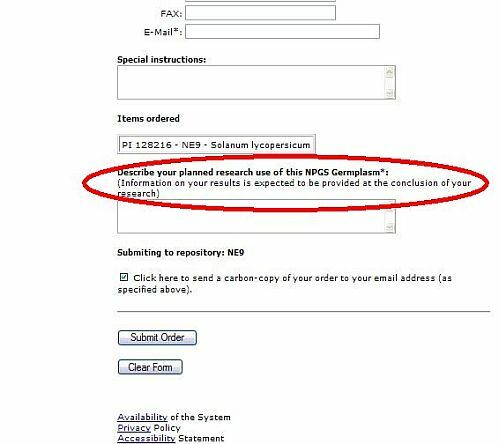 The National Plant Germplasm System (NPGS) requires information to be submitted regarding your use of this material prior to disbursement of any plant material. In addition, they also request that any results or publications be shared with the appropriate staff at the end of the research. This helps to add to the breadth of scientific information available for all users, thereby improving the effectiveness of the overall system. After clicking on the "Submit Order" button, a confirmation page is given with an email address for you to contact if you have any questions about your order. 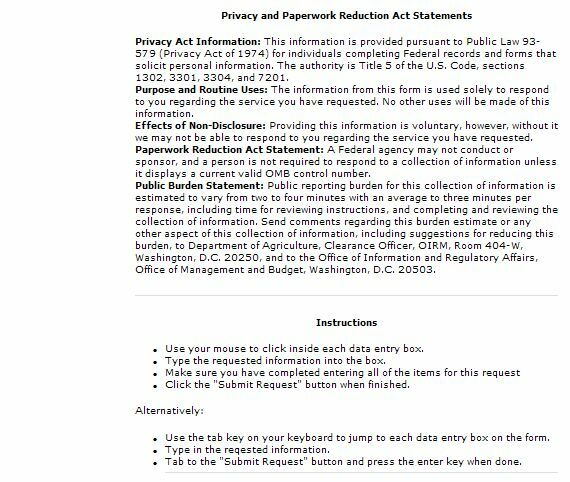 For our example, the email would go to staff at the Northeast Regional PI Station (Fig. 28). Figure 28. A submitted germplasm request. Screenshot credit: Barbara Liedl, West Virginia State University. To briefly review what we've described in this lesson, we first described why a plant breeder would want to utilize a database of germplasm accessions, such as GRIN. Some reasons included adding diversity to the germplasm resources already in her/his overall program, to incorporate a particular trait which would add value to an eventual commercial hybrid, and so forth. We then discussed what NPGS and GRIN are. Finally, we went through the steps in how to search for germplasm accessions within GRIN and how to request samples of germplasms to use in your breeding program. Liu, Z., and D. Halterman. 2006. Identification and characterization of RB-orthologous genes from the late blight resistant wild potato species Solanum verrucosum. Physiology and Molecular Plant Pathology 69: 230–239. (Available at: dx.doi.org/10.1016/j.pmpp.2007.05.002) (verified 24 Mar 2012). USDA-ARS. 1996. Seeds for our future: The U.S. National Plant Germplasm System. Available at: http://hdl.handle.net/10113/38011 (verified 24 Mar 2012). Yao, S. 2010. Wild potato germplasm holds key to disease resistance. Available at: http://www.ars.usda.gov/is/pr/2010/100616.htm (verified 24 Mar 2012). Germplasm Resources Information Network [Online]. United States Department of Agriculture–Agricultural Research Service. Available at: http://www.ars-grin.gov/ (verified 24 Mar 2012).